Is it possible to guarantee reproducibility in single node cluster? Same training data. Note: If you have H2O import a whole directory with multiple files instead of a single file, we do not guarantee reproducibility because the data may be shuffled during import. Same parameters are used to train the model. No early stopping performed or early stopping with score_tree_interval is explicitly specified and the same validation data. Is it possible to guarantee reproducibility in multi-node clusters? Clusters must have the same number of nodes. Nodes must have the same number of CPU cores available (or same restriction on number of threads). If you do not have a machine with the same number of CPU cores, see the question “How can I reproduce a model if machines have a different number of CPU cores?” below. 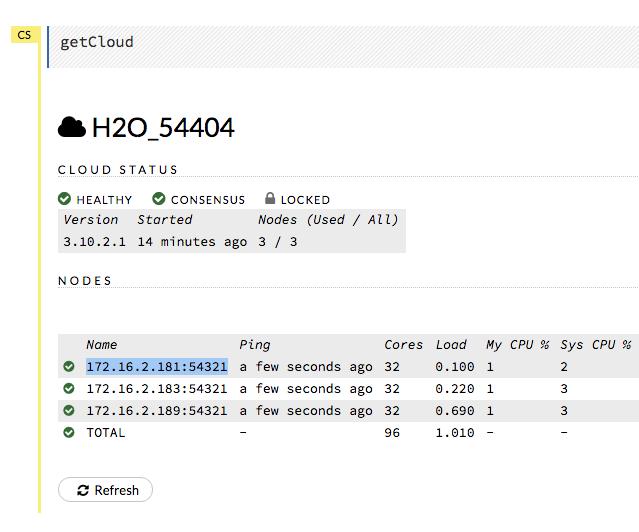 Note: When H2O is running on Hadoop, the leader node is automatically returned by the h2odriver as the node that the user should connect to. In multi-node deployments of Standalone H2O, the leader node has to be manually identified by the user. Flow users can easily check whether they are connected to the leader node by opening Cluster Status (from the Admin menu) and checking that the first node has the same IP address as they see in their browser’s address bar. Note: In H2O versions prior to 3.18.0.1, the node automatically returned by the h2odriver while running on Hadoop was not guaranteed to be the leader node. If you are using a version prior to 3.18.0.1 and you are running H2O on Hadoop, the leader node has to be manually identified by the user for reproducibility. See question “How do I reproduce a model where model training was not triggered from the leader node?” below. As long as criteria for reproducibility is met (see above), GBM is deterministic up to floating point rounding errors (out-of-order atomic addition of multiple threads during histogram building). What are the best practices to ensure reproducibility? Save any script used to pre-process the data before model training. In the event that you will need to reproduce your model, it is important to save the steps used to create the training data. This information should include how the data is imported into the H2O cluster and whether any data types have been modified (i.e., was a numeric column converted to categorical). Save information about the H2O cluster. What are the number of nodes in the cluster? What are the number of CPU cores available? Save the H2O binary model. Refer to Saving and Loading a Model for more information. The binary model will contain the H2O version and the parameters used to train the model. You do not need to explicitly set a seed to make a GBM model reproducible. If no seed is set, then H2O-3 will randomly choose a seed. This seed is saved in the binary model. To reproduce your model, you can extract the seed from the binary model and re-train the GBM with the seed set. How can I reproduce a model if machines have a different number of CPU cores? "Rebalancing train dataset into 145 chunks." If the logs show that rebalancing has occurred, reproducibility is not possible. If the logs do not mention rebalancing, continue to Step 2. In the logs of the initial model, search for the line that says: ParseSetup heuristic. On that line in the logs, the chunk size will be defined. In this example, the chunk size is 1016493. Load data with the defined chunk size. Repeat Steps 2-3 if you used validation data. Train your model. 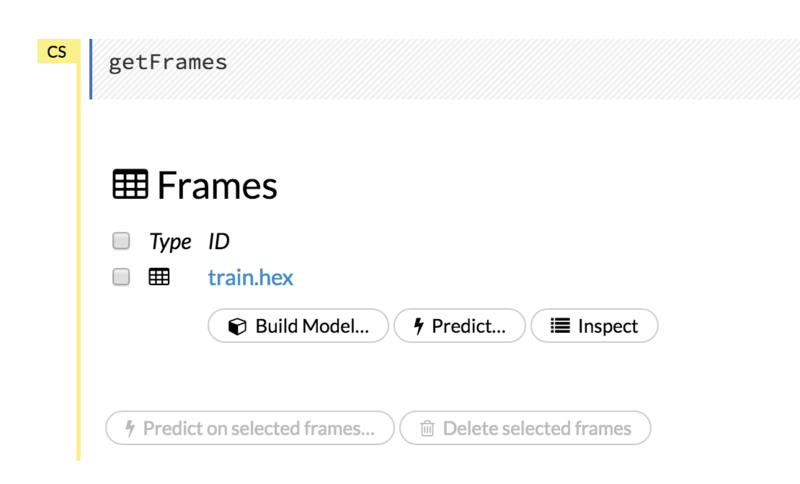 If you are using Flow, you will be able to see the datasets from the Frames menu when you select Data > List All Frames. If the logs show that rebalancing has occurred, you will not be able to reproduce the model. How do I reproduce a model where model training was not triggered from the leader node? Unzip the logs from one of the nodes (the node chosen does not matter) and open the info logs. In the logs, search for Cloud of size N formed [...]. For example, in this 3 node cluster, I am searching for the term: Cloud of size 3 formed. Copy the list of nodes - this describes the order of the nodes. Save this information in a separate document. Below is an example. You may have to try opening multiple zip files to find this term in the logs. Determine the order of the node found in Step 2. In our example, the IP and Port processing requests was:172.16.2.184:54325. We will need to find where that node is in our node order document. In our example, this is the first node in our list. This cluster must have the same number of nodes as the cluster used to train the inital model. Open Flow. When the H2O cluster is up, you will see the following similar output in the command line. Open Flow using the URL provided in the output. Review the Cluster Status in Flow by selecting Admin > Cluster Status. Find the IP address that corresponds to the node we need to connect to from Step 1. Remember that in our example, we have to connect to the first node listed. This means that we need to connect to the first node listed in the Cluster Status. Use the selected IP address to connect to H2O from R, Python, or Flow and re-train the model you are interested in reproducing. Note: If you are using Flow, this means you must open Flow in a new browser with the IP and port selected.